Here’s another great geometry + algebra problem, posed by Megan Schmidt and pitched by Justin Aion to some students in his Geometry class. Following is the problem as Justin posed it yesterday. Justin described the efforts of three of his students’ on his his ‘blog. Following is my more generalized approach. Don’t read further if you want to solve this problem for yourself! My first instinct in any case like this is build it in a dynamic geometry package and play. Using my TI-Nspire, without loss of generality, I graphed a circle centered at the origin, constructed a tangent segment at the bottom of the circle centered on the y-axis, and then used that segment to construct a square. I recognized that the locus of the upper right corners of all such squares would form a line. That made it clear to me that for any circle, there was a unique square that intersected the circle three times as Megan had posed. Seeing this and revealing its algebraic bias, my mind conceived an algebraic solution. 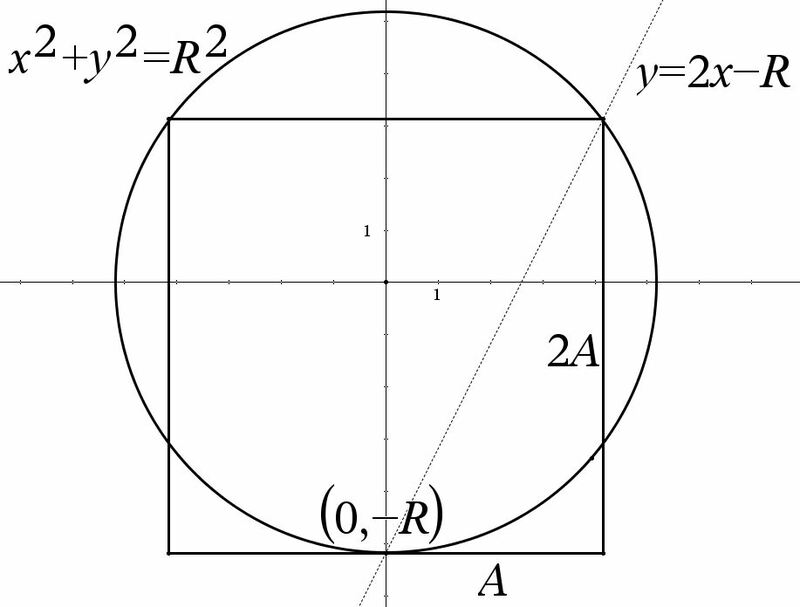 Assuming the radius of the circle is R, the equation of my circle is making the lower y-intercept of the circle . That made the locus line containing the upper right corner of the square. The output confirms the two intersections are and the unknown at . Because of the horizontal symmetry of the square with respect to the y-axis, the system solution shows that the generic length of the side of the square is . The circle’s y-intercept at means the generic diameter of the circle is . And this is independent of the circle’s radius! 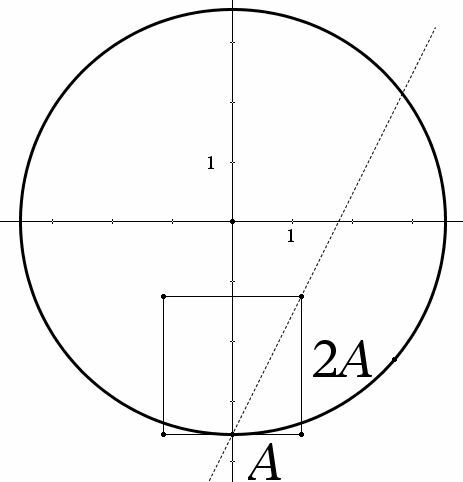 The diameter of the circle is always of the square’s side. 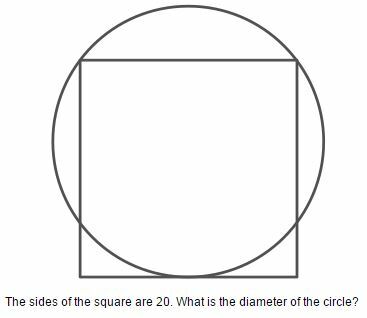 For Megan’s particular case with a side length of 20, that gives a circle diameter of 25, confirming Justin’s students’ solution. Does anyone have a different approach? I’m happy to compile and share all I get. While not necessary for the generalized solution, it was fun to see a 3-4-5 right triangle randomly appear in Quadrant 1. Here’s a proof of the Pythagorean Theorem by way of vectors. Of course, if your students already know vectors, they’re already way past the Pythagorean Theorem, but I thought Richard Pennington‘s statement of this on LinkedIn gave a pretty and stunningly brief (after all the definitions) proof of one of mathematics’ greatest equations. where is the angle between and . Here are three variations of geometry problems I got from @jamestanton on Twitter. The numerical measure of a rectangle’s area and perimeter are equal (P=A) (obviously the units are different). If the rectangle’s sides have integer lengths, what are the dimensions of the rectangle? The numerical measure of a box’s surface area and volume are equal (V=SA). If the box’s sides have integer lengths, what are its dimensions? The numerical measure of a right triangle’s area and perimeter are equal (P=A). If the triangle’s sides have integer lengths, what are its dimensions? shows that no other solutions exist. Find convincing arguments that you have found all of the solutions for each. While my solutions are shown below, I eagerly welcome suggestions for any other approaches. DO NOT READ ANY FURTHER IF YOU WANT TO SOLVE THESE PROBLEMS ON YOUR OWN. Let the a=length and b=width. Without loss of generality, assume . Then, which implies . If . If . Thus, the only rectangles for which are a 3×6 and a square with side 4. Let the a=length, b=width, and c=height. Without loss of generality, assume . Then, which implies . It wasn’t worth it to find all these by hand, so I wrote a quick spreadsheet to find all c values for given a and b values under the condition . Therefore, there are 8 such boxes with integer dimensions: 3x7x42, 3x8x24, 3x9x18, 3x10x15, 4x5x20, 4x6x12, 5x5x10, and 6x6x6. Let the legs be a and b and the hypotenuse be c. Perhaps there is a way to employ the technique I used on the first two problems, but my first successful solution invoked a variation on Euclid’s formula: For some integer values of k, m, and n with , and will form all Pythagorean triples (although not uniquely). which Euclid’s formula converts to . , but this leads to a repeat of the first solution. Therefore, there are only two right triangles with the property : the 6-8-10 and the 5-12-13 right triangles. Again, any other solution approaches are encouraged and will be posted. Kudos to Dave Gale and chris maths for their great posts about introductory lessons that inspired the questions I pose below. At this point, I don’t have an answer to the query, but I welcome any insights and particularly any other spin-off ideas you may have. 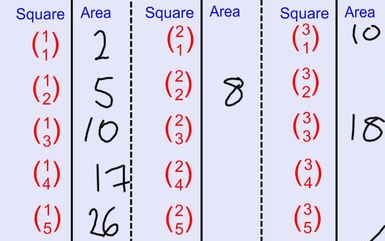 If you have a standard sheet of square grid paper whose dots are exactly 1 unit apart and I ask you to draw a square of area 1, a square of area 4, and a square of area 9, you would probably quickly respond with the following. Then I ask you to draw a square of area … [deliberate pause] … many immediately begin to think of continuing the pattern to area 16, but instead I ask for a square of area 10. 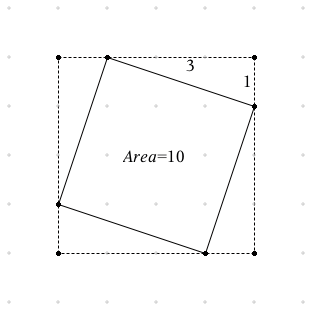 Whether you know the Pythagorean Theorem or just how to compute the areas of squares and triangles, some experimentation hopefully will lead you to some form of the following figure which shows a square with area 10. The real twist for students here is that they need to adjust their point of view from what I’ll call horizontal squares (above) to tilted squares (below). 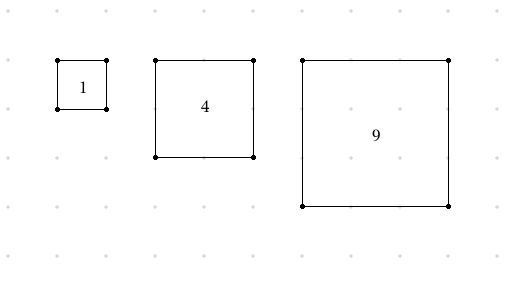 1) What square areas can be created using square grid paper? 2) What areas of squares can be created more than one way? 3) Is there a largest square area that can NOT be created using square grid paper? Do not read any further if you want to work on these questions yourself. What follows are my musings on these questions and some definite spoilers are included. Perfect squares (1, 4, 9, 16, 25, 36, …) obviously can be found using increasingly larger horizontal squares. Dave’s ‘blog post gives a great start at the non-perfect, tilted squares. Whether this list ends depends on the solution to posed question #3. Comparing the horizontal and tilted lists, the first area that can be found both ways is 25. I briefly thought that was an amazing find until I remembered that the smallest integral Pythagorean Triple is 3-4-5. 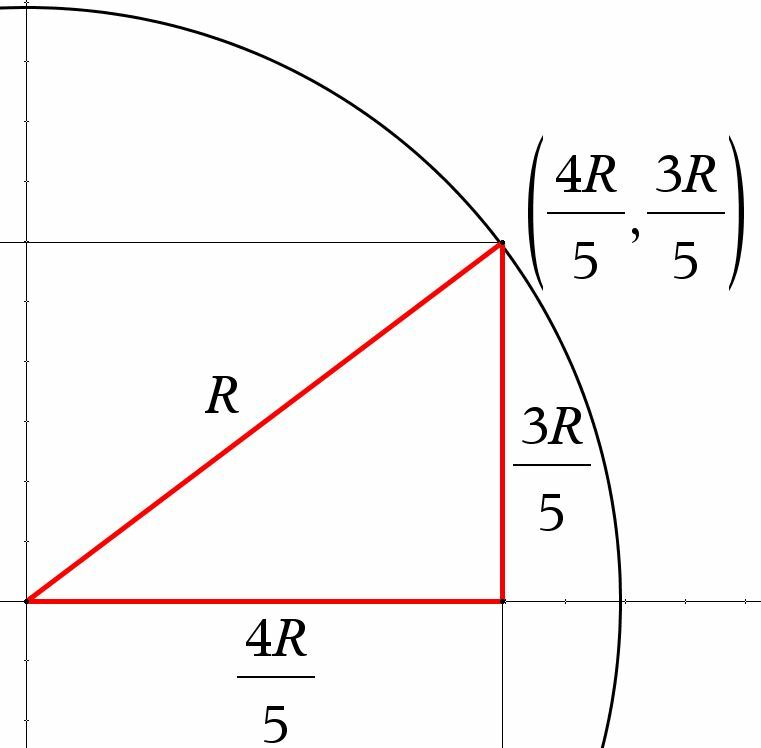 So a tilted square whose vector position (using Dave’s language) can be expressed as [3,4] can also be created using a horizontal side of 5–the Pythagorean Theorem arises! There may be other ways to get equivalent square areas (I’d love to hear any if you know some! ), but any integral Pythagorean Triple represents a square area that can be represented at least two ways on square grid paper. There are an infinite number of such equivalences. I don’t know the answer to this, but I think I’m close. I’ll post the problem before I finish it for the fun of letting others into the enjoyment of solving what I think is a cool pre-collegiate level math problem. can not be drawn on square grids? If so, then there is no maximum area of a square that cannot be drawn using square grid paper. If not, then the solution to this question may lie in a direction I have not conceived. Again, I don’t know the answers to questions 1 or 3. Discussion is welcome and encouraged.